BOC Edwards Spectron 300E portable makes possible fast, effective leak detection over the range 4000 to 4 ´10-10 mbar ls-1 without liquid nitrogen. Together with the lightweight hand-held module, the Spectron 300E represents a simple to use, readily portable and reliable wide range leak detector. The Spectron 300E is a portable device with a wide detection range – 4,000 to 4 x 10-10 mbar ls-1 – and finds large and small leaks without the need for costly accessories. It is fast – ready to operate in less than five minutes – and its unique double diffusion pump provides high performance with rugged reliability. 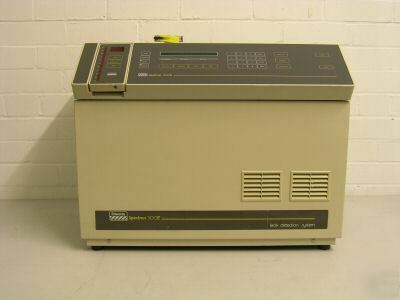 The Spectron 300E incorporates a helium mass spectrometer. The hand-held control module operates up to 25m from the detector and can be fitted with a visco probe or spray probe to enable single-handed leak detection. The Spectron 300E employs a unique double diffusion pump system for high performance combined with rugged reliability. One of the BOC Edwards E040 air cooled diffusion pumps continuously pumps the mass spectrometer head through a special restrictor, the other pumps the test piece. The high compression ratio achieved gives a fast response and very fast clean-up times unaffected by helium in the backing line. In addition, the sensitivity of the Spectron 300E is independent of the size of the backing pump used. THE PRICE INCLUDES VAT, IF YOU ARE OUT OF EU WE WILL DEDUCT THE VAT, IF YOU ARE VAT REGISTERED WE WILL INVOICE YOU £INCLUDING VAT SO THAT YOU CAN CLAIM IT BACK. Please email if you have questions or need any further information.